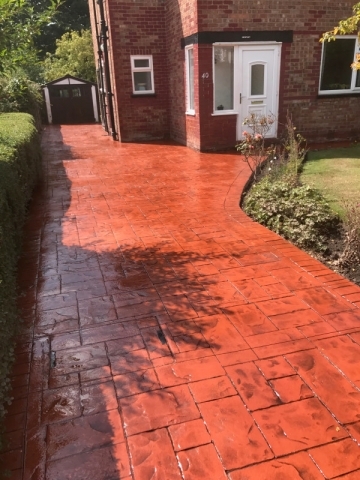 Lasting Impressions was recently asked to lay a new driveway to the front and side of a house in Timperley. With a wide range of styles and finishes there is always something to suite everyone’s taste. In this instance, our clients opted for terra-cotta with charcoal release printed in ashlar cut stone. The driveway skirted the hedge to one side and garden to the other and perfectly complimented its surroundings. An ugly manhole tray on the driveway was also cleverly disguised and as you can see from the pictures is very hard to identify, but still provides easy access to all the services. You may have a definite idea about what you want and with the range of options we have, we are convinced that we can meet your requirements. On the other hand, if you are not sure what to have, we can point you in the right direction. Not only does a new driveway improve the overall appearance of your home and add curb appeal, but in the long term, it can increase the value of your property and saleability of it, making this type of home improvement a great investment! 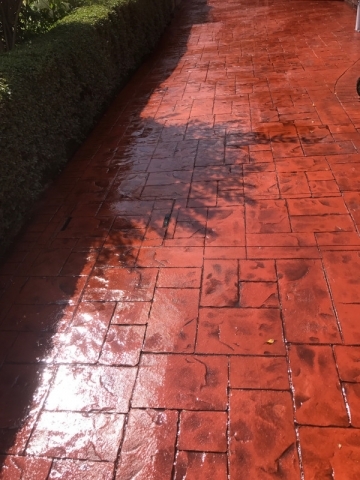 Considering a new pattern imprinted driveway, re-surfacing or re-design? Please feel free to get in contact with Lasting Impressions as we can give you free, no obligation advice, using our extensive knowledge and experience, having a proven track record in designing and installing new concrete driveways or re-surfacing existing driveways. Ring us on 0161 980 8822 or email us at sales@lastingimpressionsdriveways.com for your free consultation.